Compact form, beautiful color combinations, and a floriferous nature make this salvia a definite ‘do try’. Salmon-colored flowers with creamy-yellow suffused with pink bring delightful tones of the sunset. Dusky red calyxes and stems accent the flowers. Attracts hummingbirds and is deer resistant. Pair with dark-leaved perennials or annuals to complement the stems and give the flowers a pop. Full-part sun. Height and spread 16-24”. Good drainage. 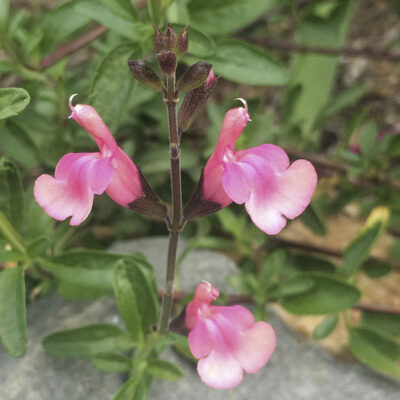 Sometimes referred to as Salvia x jamensis ‘Senorita Leah’. Cooler temperatures bring deeper colors. Zones 6b-9.